Caffe’Tomeucci was founded in 1883 in Italy (Rome). The then small company was established as a roasting shop offering tastings of all the best coffee blends imported from the tropical areas of the world. The shop was situated by the Foro Traiano, in the ancient heart of Rome. 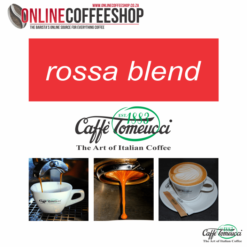 As business steadily grew Caffè Tomeucci won success and appreciation for the excellent quality of it’s products. In the last 100 years Caffè Tomeucci has had to relocate its business to a modern computerised roasted in Aprilla not far from Rome – but the passion and respect for the Italian coffee tradition continues with strict adherence to the old roasting process. Nowadays the fourth generation Tomeucci family heads the company. 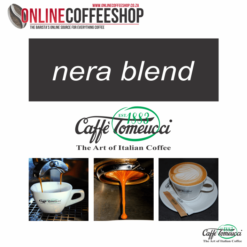 Caffé Tomeucci has become an Italian trademark synonymous with a product of high quality coffe supplying espresso bars throughout Italy. Italy invented the espresso and cappuchino – and Caffè Tomeucci has been there from the beginning. We bring this quality coffee to you in South Africa. Buy online and get fast delivery.